IIS 10.0 is the latest version of Internet Information Services (IIS) which released with Windows Server 2016 (also can be used under Windows 10). Will take tour of these new features in this article. Nano Server boasts a 90 percent smaller installation footprint than the Windows Server graphical user interface (GUI) installation option to more about non server please refer my old blog What is new in Windows Server-2016. Nano Server is a new Non-GUI OS in windows 2016, only 64-bit installation option available with Windows Server 2016 which installs small footprint of enough OS, thereby. You can currently run ASP.NET Core, Apache Tomcat, and PHP workloads on IIS 10.0 on Nano Server. Nano Server provides higher density, increased uptime, and a smaller attack surface making it suitable for running web workloads. Also addition to using iis 10.0 as an reverse proxy to any HTTP listener via the “HttpPlatformHandler” module. Containers are the next evolution in virtualization; a container is an isolated place where an application can run without affecting the rest of the system and without the system affecting the application. Windows Server 2016 offers two different types of "containerized" Windows Server instances, Windows Server Container & Hyper-V Container to Learn more about Containers: What is new inWindows Server-2016. IIS 10.0 support both container runtimes as well as on both base OS images, Server Core and Nano Server, allowing you to choose the best Windows container environment for your web workloads. You can use IIS base images which are available on Docker Hub or deploy and ASP.NET MVC applications to IIS running inside a container. 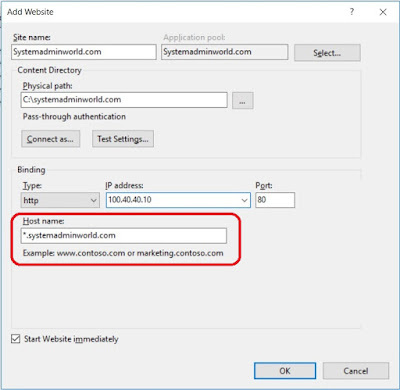 Wildcard Host Header Support introduced in IIS 10, wildcard host header support a webserver a domain e.g systemadminworld.com and it can be request any subdomain as below. 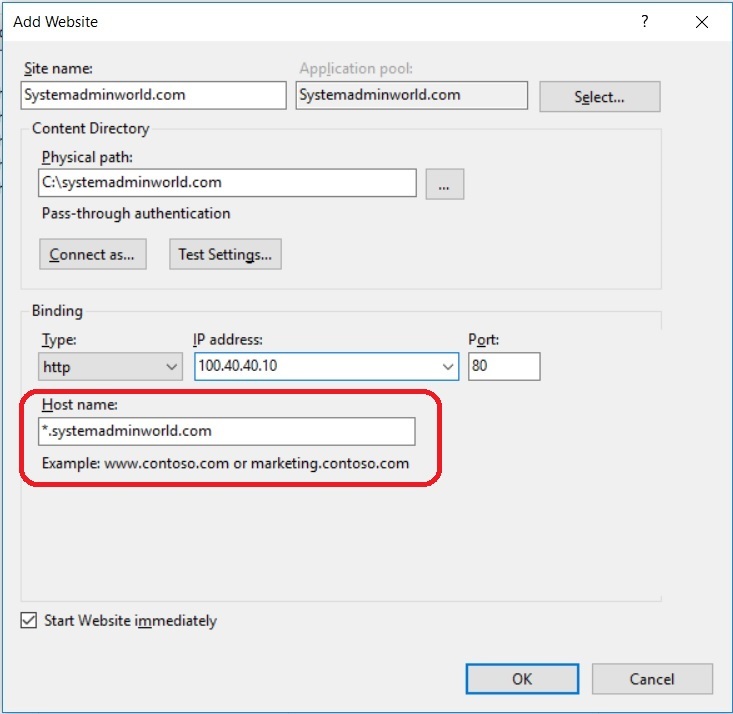 In IIS 8.5 and earlier wildcard host headers were not support prior to IIS 10.0, you can now set up bindings to serve requests for any subdomain within a given domain. Almost all browsers already support HTTP/2 in their most current release, you might already be using HTTP/2 at client side. You need not to change anything in your application for HTTP/2 to work, In IIS 10.0 implemented HTTP/2 as transparently as possible. IIS currently supports HTTP/2 only over TLS. 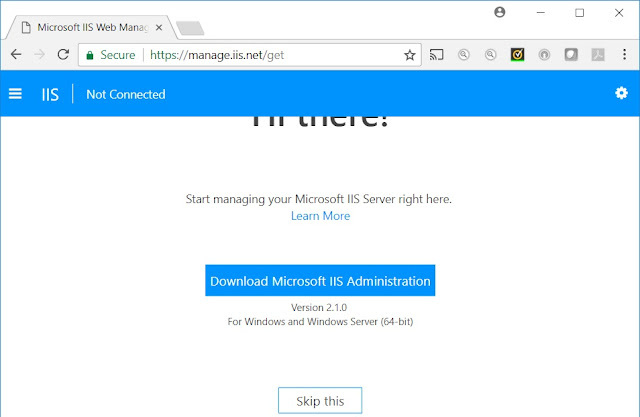 To take advantage of Windows Nano Server and Windows containers, IIS now introduce new advanced management method in Windows server 2016 with IIS 10.0, that is Microsoft IIS Web Administration (https://manage.iis.net). New IIS Administration tool is a REST API which allows you to configure and monitor your IIS instance, with this API users can use this advance tool and can take advantage of new IIS web management console. This is open-source application and available on GitHub, this tool support legacy IIS version starting from 7.5 and above. With the advent of Nano Server and Windows Containers, IIS now provides a better management story for all environments running (including those without a GUI). With Windows Server 2016, IIS 10.0 supports automatic ideal CPU assignment for its thread pool threads to enhance the performance and scalability on NUMA hardware. This feature is enabled by default and can be configured through the registry key changes. In this feature, IIS thread manager makes its best effort to evenly distribute IIS thread pool threads across all CPUs in all NUMA nodes based on their current loads. In general, it is recommended to keep this optimization enabled for NUMA hardware. We will explore all above new functions with the configuration steps in our following blog, stay tuned.